Hypoxia is a condition often found in solid tumors, where insufficient oxygen is available for cells to carry out their metabolic activities. As a result, these cells switch from aerobic mode of metabolism to the anaerobic glycolysis pathway in order to proliferate . In addition to promoting tumor angiogenesis and metastasis, hypoxia can also make tumors resistant to radiation therapy and chemotherapy by reducing the bioavailability of molecular oxygen which acts as a radiosensitizer [2, 3]. The occurrence of hypoxia, however, is not restricted to tumor regions alone. It also plays a key role in determining the survival and growth of tissue engineered scaffolds in vivo. Cells within an engineered construct experiences hypoxia initially on implantation, until new blood vessels are recruited to the area . According to previous reports, an oxygen gradient can be observed within three-dimensional bone constructs due to high cell proliferation. This can result in hypoxia particularly in the central regions of the scaffold, causing cell death . Hypoxia and absence of nutrients can also cause massive mesenchymal cell death which renders the construct seeded with them, unviable . It is therefore necessary to monitor oxygen levels within tissue engineered constructs to determine their fate after implantation. Additionally, studies on mouse embryonic stem cells have shown oxygen-dependent differentiation and proliferation into neural cells in vitro . A method of monitoring hypoxic conditions would thus be important to prognosticate stem cell growth and viability both in vitro as well as in vivo following implantation. The past two decades have seen an increased interest in developing MR contrast agents for cellular and molecular imaging. Gadolinium chelates, superparamagnetic iron oxide (SPIO) particles and have all been used as imaging agents to non-invasively monitor cellular processes or the behavior of macromolecules in vivo . Earlier, MRI methods were widely used for visualization and tracking of implanted cells, based on the contrast generated by the internalization of iron oxide particles [9-11]. More recently, perfluorocarbon (PFC) emulsions have been successfully used for cell labeling and tracking [12-16]. PFC nanoemulsions have also been used in 19F MR oximetry based on the sensitivity of the perfluorocarbon fluorine resonance spin lattice relation time (T1) to pO2. Several fluorescence as well as magnetic resonance (MR) techniques are currently in use to measure oxygenation in tissues [17, 18]. As an alternative approach, our lab recently demonstrated that hexamethyldisiloxane (HMDSO) could be used to quantitatively measure oxygen tension (pO2) in tissues using 1H MR [19, 20] and we have developed HMDSO-based nanoemulsions as pO2 nanoprobes  . Submicron and nanoemulsions have been established and used as drug delivery systems for solubilization of poorly water-soluble drugs and imaging probes, reduction in toxicity and, targeted delivery to various organs . The current study demonstrates the formulation and application of Nile Red-doped, HMDSO-loaded, nanoemulsions as nanoprobes for dual modality (MRI/fluorescence) dual functional (detection/oximetry) cellular and molecular imaging. Fluorescence imaging offers sensitive detection of fluorochromes at nanomolar concentrations and allows simultaneous multispectral imaging of several biological processes. These attributes are complementary to those of MRI such as high spatial resolution, excellent soft tissue contrast, and ability to image tissue function and makes the combination of MRI with fluorescence imaging highly desirable. Correspondingly, there has been much interest recently in development of dual-modality MRI-fluorescence probes[23-31]. For targeting and cell-labeling applications [32-35] (e.g. stem cells) dual modality probes offer additional advantage of enabling ex-vivo validation by fluorescence microscopy. HMDSO and Nile Red dye were purchased from Sigma Aldrich (St Louis, MO, USA) while Soybean Lecithin was purchased from MP Biomedicals, LL (Solon, OH) respectively. Solutol HS15 was a gift from BASF Corporation (Ludwigshafen, Germany). MCF7-wild type breast cancer cells (ATCC) were stably transfected with green fluorescent protein (GFP) gene in our lab. NIH-3T3 fibroblast cells were kindly provided by Prof. Liping Tang of University of Texas at Arlington. The dual-modality nanoprobes were prepared by modifying the procedure used by us previously  to synthesize MRI based pO2 nanoprobes. The modification involved addition of a second surfactant, soybean lecithin, for improved stability . Briefly, a 2% v/v HS15: 1% w/v soybean lecithin surfactant mixture, in de-ionized water, was used to emulsify a payload of Nile Red (0.25 mM) dye in HMDSO. Surfactant was heated to ~60oC while stirring for 2 minutes. Once the surfactant solution became slightly translucent, HMDSO/Nile Red mixture was added drop-wise so that the final emulsion would have 40% (v/v) HMDSO and 0.1 mM Nile Red dye and continued to be stirred while heating for 15 minutes. This starting emulsion was then subject to high power probe ultrasonication and extrusion filtration , to obtain the dual modality nanoprobes. Particle size measurements were carried out using DynaPro Titan dynamic light scattering (DLS) instrument (Wyatt Technology Corporation, Santa Barbara, CA, USA). 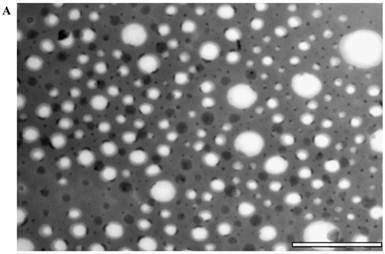 The results from the DLS were correlated with observation of the nanoprobes using TEM (FEI Tecnai G2 Spirit BioTWIN, Hillsboro, OR) negatively stained with phosphotungstic acid. Finally, the presence of HMDSO in the nanoprobes after synthesis was confirmed using Varian INOVA 400 MHz NMR. At pre-determined time points (0, 1, 2, 5 and 24 hours) post synthesis in de-ionized water, the particle size was measured using DLS to check for aggregation and/or variation in particle sizes(n=5 replicates). To study the stability in human plasma, the nanoprobes were added to a 50% plasma solution and maintained at 370C and particle size was measured over time, as above. To assess cytotoxicity, 3T3 fibroblast cells were seeded in a 48 well plate at a density of 105 cells per well and incubated for 24 hours to allow the cells to attach to the bottom of the wells. These cells were then incubated with the nanoprobes at increasing concentrations for 4 hours. The experiment was conducted in triplicates for each concentration. At the end of the 4-hour incubation, the media was removed and the cells were washed with PBS. The PBS was then replaced with fresh media and the appropriate ratio of MTS assay solution (Promega Corporation, Madison, WI, USA) per well. Following 1 hour incubation with MTS assay, cell viability was measured using a microplate reader at an absorbance wavelength of 490 nm. The same procedure was repeated using varying concentrations of the surfactant combination. To study the uptake and localization of the nanoprobes, MCF7-GFP cells were first seeded at a density of 90,000 cells per well in a glass bottom dish and incubated for 2 days prior to the experiment. The dishes were placed in a 5% CO2 environment within the confocal microscope (Zeiss LSM 50) chamber for 30 minutes to allow the cells to settle down. Based on the results of the cytotoxicity study, nanoprobes were added to the cells at the beginning of the experiment to a concentration of 0.2% v/v in media. The MCF7-GFP cells were imaged for 30 minutes at 2-minute intervals using excitation wavelengths of 488 nm and 561 nm for GFP and Nile Red, respectively. The images were processed from z-scans of 1µm thickness using ImageJ software. MRI and Fluorescence imaging were carried out to test the utility of the synthesized nanoprobes for dual modality/ dual functional application of the nanoprobes. To prepare the sample, 100 µl of phenol red-free BD Matrigel™ basement membrane matrix containing 5 x 106 wild type MCF7 cells, devoid of media, were added to a 2 mL tube. The cell-matrigel mixture was allowed to gel at room temperature for about 2 minutes. Then, 200 µl of the matrigel was added to the tube to form a separate layer above the matrigel layer containing cells and allowed to gel. Matrigel-nanoprobe mixture (700 µl, 10:1) was added and allowed to set at room temperature. The tubes were immediately sealed to prevent further entry of oxygen into the tubes. Fluorescence imaging was performed using CRi Maestro imaging system. MRI studies were performed on a Varian 4.7T MRI scanner (Agilent Inc., Palo Alto, CA, USA). Following acquisition of water and HMDSO resonance selective spin-echo MR images, oximetry was performed over 4 hrs using the PISTOL technique  to measure changes in partial pressure of oxygen due to oxygen consumption using a previously published calibration curve  that relates the relaxation times measured by PISTOL to quantitative pO2 values. Voxel-wise statistical comparisons (one way ANOVA) were made using MATLAB on the pO2 values. The size of the nanoemulsion formulations was obtained using DLS and compared with semi-automated image analysis from the TEM image (Figure 1). The use of phosphotungstic acid enabled the visualization of nanoprobes by a negative contrast effect (light on a dark, electron-dense background). The average radius as measured by DLS was 71±39 nm while that from TEM was 58±33 nm. The spectra obtained using 1H NMR showed a distinct HMDSO peak at around 0.02 ppm, well separated from the water peak at 4.7 ppm. The ratio between the HMDSO and water peak areas from the NMR spectrum was observed to be 0.69. To determine the stability of the nanoprobes in DI water and 50% human plasma, radii were measured by DLS at fixed time-points for up to 24 hours. 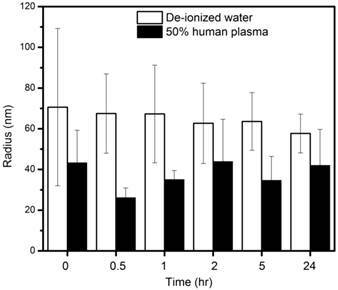 The nanoprobes showed good stability in both de-ionized water as well as plasma for the entire duration of the experiment (Figure 2) and showed no significant aggregation between the probes. Studies were also conducted to analyze in vitro biocompatibility of nanoprobes and the surfactant combination using NIH 3T3 fibroblast cells. 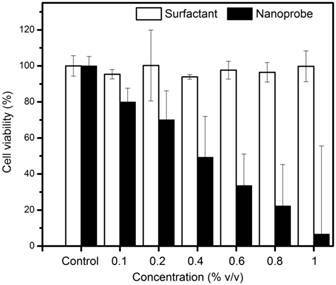 While 3T3 cells maintained close to 100% viability at all concentrations of the surfactant combination tested, they achieved IC50 at a nanoprobe concentration at around 0.4% (v/v) (Figure 3). 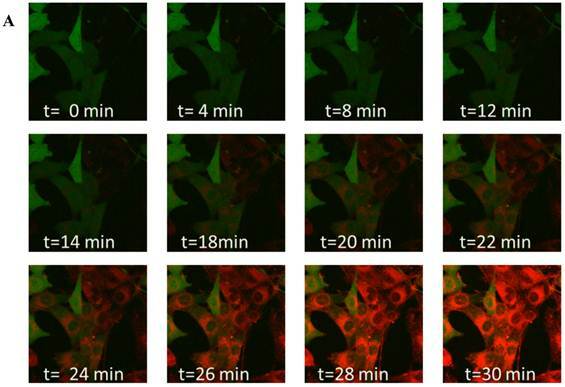 To study time-dependent uptake of the nanoprobes, MCF7-GFP cells were incubated with nanoprobes and imaged for half an hour at 2-minute intervals (Figure 4 A). Confocal microscopy showed the localization of the nanoprobes within the cytosol. Measurement of mean intensities in a region of interest within a cell showed that the GFP fluorescence remained constant throughout the duration of the experiment while Nile Red fluorescence increased substantially over time (Figure 4B). 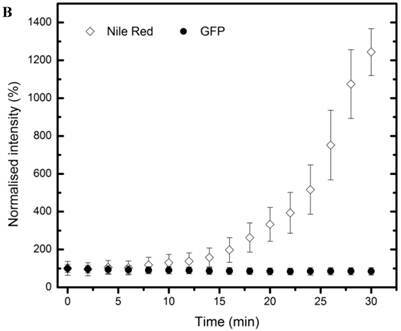 A gradual but distinct increase in Nile red fluorescence could be observed within the cytosol of MCF7-GFP cells for the first 18 minutes of incubation followed by a more rapid uptake subsequently. The Nile red fluorescence intensity was not observed to saturate till the end of the observation period (30 min) indicating that further uptake of nanoprobes was possible beyond 30 min. MR and Fluorescence imaging was carried out on tightly-sealed samples containing both the nanopobes as well as MCF7 cells to study the dual functionality of the nanopobes (Figure 5A). 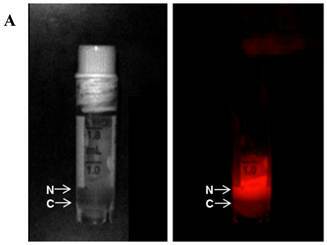 Fluorescence could be easily detected in the layer containing the nanoprobes indicating that they could be potentially detected using fluorescence imaging in vivo at these concentrations. 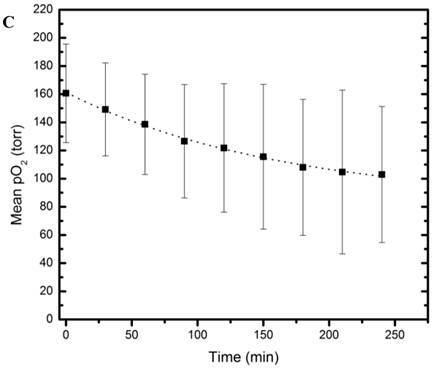 PISTOL imaging showed a gradual decrease in pO2 within the sample for 4 hours as the cells metabolized the existing oxygen within the tube (Figure 5B). A one-way ANOVA comparing pO2 values (n=36 voxels) over 8 time-points (spanning 4 hrs) showed that the decrease in pO2 was statistically significant (p<<0.001). A clear oxygen gradient was observed with the region closer to the cell layer showing higher oxygen depletion over time with pO2 values~ 40 torr. Fitting the mean pO2 value using an exponential decay curve pO2(t)= A+B*e-kt yielded fit constants A= 83 ±5 torr, B=78 ±5 torr and k= (6.1± 0.8)X10-3 min-1 (R2 =0.996). Based on these pO2 kinetic parameters and assuming an oxygen solubility of 7.6 mg/mL, the initial oxygen consumption rate can be calculated to be 0.10 nmole/106 cells/min which reduces to 0.03 nmole/106 cells/min at 4 hrs. Particle stability study: Particle size of nanoprobes in deionized (DI) water and 50% human plasma measured by dynamic light scattering (DLS) over 24 hr. Cytotoxicity assay: 3T3 fibroblast viability assessed at different concentrations of surfactants and nanoprobes. Live cell imaging: (A) Confocal microscopy composite images showing time-dependent uptake of the nanoprobes by MCF7-GFP cells over a period of 30 mins. (B) Graphical representation of changes in Nile red and GFP fluorescence over time within a region of interest in a MCF7-GFP cell cytoplasm. Dual modality (MR and Fluorescence) imaging: (A) White light (left) and fluorescence (right) images of sample containing the nanoprobes (N) and 5 X106 MCF7 cells (C) in separate layers. (B) MR imaging of the same sample allows visualization of the nanoprobes and oximetry using the PISTOL technique as well as pO2 changes over time upon sealing the sample. (C) The mean pO2 vs time graph shows the decreasing trend of pO2 due to oxygen consumption by MCF7 cells (p<<0.001, one way ANOVA). In this study, Nile Red doped HMDSO based nanoprobes were successfully formulated for fluorescence imaging and 1H MRI based oximetry. A surfactant combination consisting of Solutol HS15 and soybean lecithin was used to emulsify HMDSO. Solutol HS-15 is a non-ionic emulsifier and drug solubilizer containing hydrophilic polyethylene glycol (PEG) and lipophilic 12-hydroxystearic acid. Soybean lecithin is primarily composed of L-α-phosphatidyl choline. Lecithin is frequently used in the preparation of nanoemulsions for drug delivery to the area of interest  while Solutol HS15 has been used as a solubilizer or co-surfactant in the preparation of various nanoemulsions . Both surfactants are nonionic and ampiphilic which aids in encapsulating and transporting the hydrophobic HMDSO doped with the fluorophore into the interior of the cell. Particles of radius less than 5 nm are rapidly cleared by the kidneys (renal clearance) while particles of radius larger than 100 nm are removed via phagocytosis . 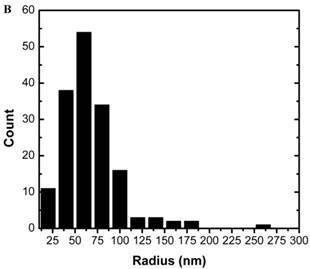 Our nanoprobes showed distribution with mean droplet radius in the 70 nm range. Although the ideally we would prefer nanoprobes of radius < 50 nm for systemic delivery in vivo, it is difficult to precisely control the droplet sizes in nanoemulsions. The size range of the droplets depends on numerous parameters such as type of surfactants used, thermodynamic conditions and time and method of preparation  . Even using the extrusion method, we observe droplet sizes greater than the filter pore size due to the deformability of the emulsion. The observed HMDSO to water ratio of 0.69 exceeds the theoretically expected ratio of 0.54. This indicates that there is no loss of HMDSO during the emulsification process, though some water may have evaporated. The nanoprobes also maintained consistent particle size in water and 50% human plasma for 24 hours indicating that there will be little to no aggregation in body fluids when used in vivo. This could also prevent rapid clearance of the nanoprobes from the body. Particle sizes were seen to be smaller in plasma than in water, presumably due to the higher viscosity and lower surface tension of the continuous phase . The surfactant combinations showed no cytotoxicity towards 3T3 cells up to a concentration of 1% (v/v). This is in accordance with published studies which show that Solutol HS15 has very low toxicity when used in vivo. Similarly, lecithin is not expected to show toxicity in vivo as it is a component of biological membranes and is frequently used in nano/micro emulsion formulation and even in food preparation . Our nanoprobes prepared using this surfactant combination, however, showed IC50 at a concentration of 0.4% (v/v). We can thus infer that incubating cells with nanoprobe concentrations greater than 0.4% (v/v) would not be feasible for cell tracking experiments. Live and fixed cell imaging experiments helped in the visualization of nanoprobes within the cytosol of MCF7 cells within 18 minutes of incubation. This indicates that our nanoprobes containing hydrophobic HMDSO successfully overcame the cell membrane barriers and could be transported into and localized within the cells. Finally, the dual modality experiment was conducted to test the dual functionality of the nanoprobes. Fluorescence imaging showed ability to detect the nanoprobes at concentrations appropriate for in vivo use. Oximetry using the PISTOL technique on the same sample allowed non-invasive mapping of oxygen tension over time and allowed the estimation of oxygen consumption. The measured values of oxygen consumption are within the range measured in vitro by other groups [44-46] for cells under various physiological conditions. We incorporated 10%(v/v) matrigel for these studies. Our observed signal-to-noise ratios (SNR) for the corresponding MR images were 134 for the longest recovery time (TR) image (TR =55 s, 1 signal average ) and 9 for the shortest TR image (TR=0.1 s, 8 signal averages ). This indicates that 5-10 fold reduction of nanoemulsion in the matrigel would still have allowed us to perform oximetry, although sensitivity limits were not tested. For MRI, the in vitro sensitivity estimates would translate well to the in vivo case. The observed SNR for the corresponding fluorescence image was 14995. While the corresponding extrapolation of this observation to in vivo fluorescence studies is confounded by light scattering and absorption in vivo, the observed SNR indicates that 3 orders of magnitude reduction in concentration would still be detectable by fluorescence. Thus cell-labeling and implantation studies at concentrations well below the IC50 could be feasible for tracking by in vivo fluorescence imaging. Further improvement for in vivo application could include replacement of Nile Red dye with other hydrophobic dyes that fluoresce in the near-infrared region [9, 47]. In conclusion, we have successfully developed HMDSO-based dual modality and dual-functional nanoprobes that can be simultaneously used for fluorescence imaging and oximetry. These nanoprobes have the potential for theranostic applications by incorporation of poorly soluble drugs in the hydrophobic HMDSO core. Another potential application of these nanoprobes can be for tracking implanted cells while simultaneously monitoring cell health via 1H MR. While analogous 19F based perfluorocarbon emulsions have been successfully used for cell tracking, a 1H MR based approach has better potential for wider applicability. The authors would like to thank Dr. Xiankai Sun for the use of the dynamic light scattering instrument and Abhijit Bugde for assistance with the live cell fluorescence microscopy. NIH-3T3 fibroblast cells were kindly provided by Prof. Liping Tang of University of Texas at Arlington. This work was supported by Norman Hackerman ARP grant #010019-0056-2007, NCI 1R21CA132096-01A1 and NCI U24 CA126608A. Corresponding author: Vikram D. Kodibagkar, Ph D. School of Biological and Health Systems Engineering, Arizona State University Tempe, AZ, 85287-9709 Email: Vikram.Kodibagkaredu.